« A Plethora of Vintage Items in Time for the Holidays! Happy New Years from Amigami!! Amigami has been very busy over the holiday season and new year, and I can’t thank all my wonderful friends and customers enough. The local auctions and eBay sales have been a complete success, and it has granted me the opportunity to expand more into the medium of stone jewelry, which is an area of design I absolutely love. The beginning of the 2011 Jewelry Line is already up, and can be viewed in full at the Amigami Etsy Shop. And of course, I will be showcasing pieces on the website regularly, so check back soon and often for updates. 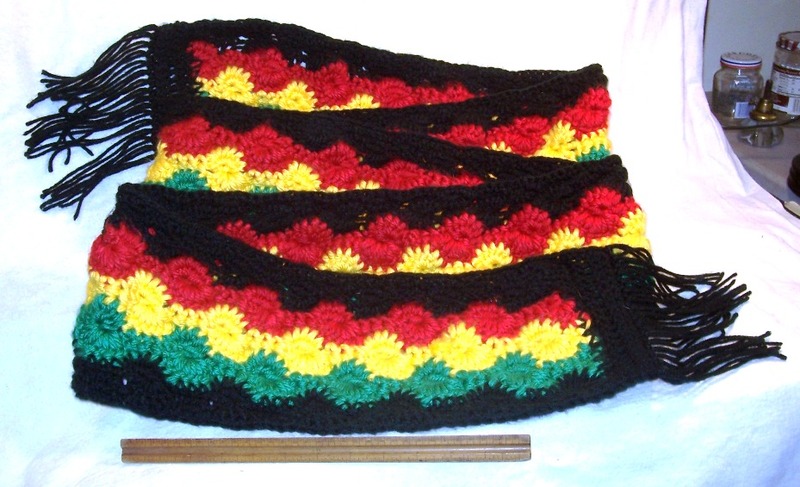 This Christmas we made several gifts for our friends, but the most exciting was what has been lovingly dubbed “The Rasta Scarf.” Using the Catherine Wheel method and heavy gauge worsted acrylic yarn, this GIANT scarf is over 9 feet long!! The picture doesn’t even do it justice, and it was near impossible to take of picture of it stretched, but I hope to get the owner to model it in a picture for me soon.